A young relative who work in Balikpapan think he is so clever, he gave me this challenge. He sent me an email with the pic above and the caption below. Suppose to test my observation skill. 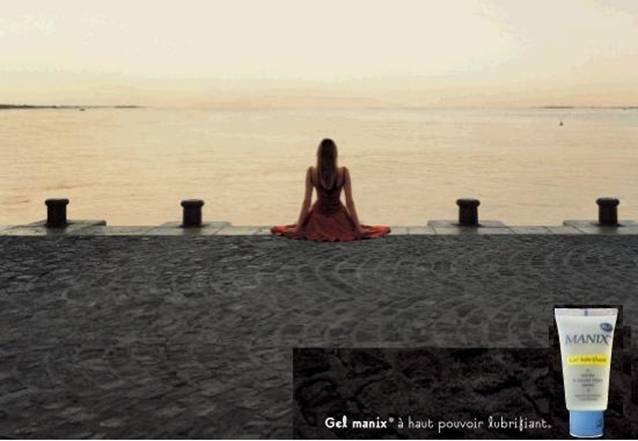 Thought you might appreciate the subtlety of this ad, done by a Brazilian ad agency, for a lubricating gel (K-Y equivalent) targeting the Frenchmarket. They were trying to come up with an ad that is not offensive or tasteless.The picture looks completely innocent until you notice the details…Apparently, it has created quite a buzz in Europe. Although my eyes are “low fah” , uncle here is no stupid you know!! uncle here eat more salt than you eat rice, walk more bridge than you walk road… Wah liao, trying to test me!! One look i already know. The gal is looking for her boyfriend or husband or gigolo lah. That poor fella must had felled into the longkang or canal something. Quite obvious slipped on the slippery KY on the pavement !! Must be true lah as this is a KY ad, right? The gal must be waiting for him to surface from the water. Poor gal! Next time wanna test uncle, try something got more brain one lah!! Anyway, dont worry, keep them coming. Uncle, although lau liao, but can still take challenge or a joke or two. Anyone not agree, pls indicate in the comment column. Best comment win one week supply of KY or equivalent. as its an ad of lubricant, see the poles at the waterfront…the girl is not sitting between them but rather…one of the pole was “inserted” in between her legs…thats how good the lubricant are!!! If your horse is at the vet. A seat along the waterfront is a fine substitute. Just don’t forget your gel. Thanks for visiting my blog. Just came by to say howdy. wah mother S and leonard eye so sharp, I didn’t have a clue, hormones are hibernating…..